The French painter Raphaël Collin (1850–1916) was particularly skilled at depicting seductive female figures. He is known as the artist under whom Western-style painters from modern Japan, including Kuroda Seiki (1866–1924), studied while they were in France. 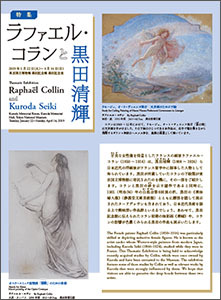 This Thematic Exhibition is being held to acknowledge recently acquired studies by Collin, which were once owned by Kuroda and have been entrusted to the Museum. The exhibition features some of those studies by Collin as well as relevant works by Kuroda that were strongly influenced by them. We hope that visitors are able to perceive the deep bonds between these two artists.